Like many wet shavers, the temptation to buy product is always looming, tantalizing. Such a cruel yet satisfying mistress. In an attempt to quench that thirst, I started combing the online shaving stores and reviews for some of the better rated, inexpensive shave creams. For my shaves I use the same prep and post-shave products each time. Pre-shave: Hot shower, leaving beard wet; Truefitt & Hill pre-shave oil (but to be honest, I’m not sure it really helps); lather beard for at least a full minute. Shave: 1948 Gillette Superspeed with an Iridium Super blade. Post-shave: Warm/hot rinse, cool rinse; blot major drips of water with towel but leave beard moist; Pre de Provence after-shave balm. The manufacturer lists the scent simply as Citrus (Bergamot), which I do believe describes it well. To my nose it is a one-note scent, but it is refreshing. A strange beast to say the least. According to the instructions adding less water is better. I don’t believe it was formulated for the brush, so I wasn’t able to produce lather with the usual consistency. Even though the cream itself is fairly dense, the lather consistently has a more open structure; slightly more foamy than creamy. I feel like I need to use a bit more product to achieve the same amount of lather to which I am accustomed. Seems to take about 60-90 seconds to produce the lather. (View their FAQ about using a brush and bowl). This stuff is super slick! The razor glides absolutely effortlessly over my beard. You know the feeling you get when you move the hand-mallet over an air hockey table? Yeah, kinda like that. The hair that gets shaved off appears to have a much finer cut than with other creams. The shaves I get from Cremo Cream are fairly close, but I’ve never gotten a really consistently good shave. I feel like it’s missing some richness, whether using a shaving brush or not. When used as a slicking agent with another cream, like AoS unscented, it’s incredible. I wish it came in an unscented version just for the purpose of adding slickness to other creams. The 6 oz. (177 ml) tube of Cremo Cream has been in my arsenal for a while, so I don’t remember exactly how much I paid for it, but the price seems to average $7-9 (US) online. I give the cream a 6.5/10 (9/10). Mens Shave Cream is paraben free. I’ve been using Cremo for months now…I bought it on a whim and it was cheap. Anyway, reading the reviews here it appears people are over-thinking this shaving product. First of all, you MUST follow the instructions exactly. If you do, then it’s like putting ‘teflon’ on your face. My razor is an Everysharp Schick G model which is semi-aggressive for my face. For me one pass is fine even with 3 days growth and then a touch up on what I missed or needed extra. I have to say I miss the ‘ceremony of the brush’ but to be honest I never got the ‘glide’ that I do with Cremo. I must admit though there’s something awesome about using shaving soap. Sadly in some ways, if you use Cremo it means giving up the brush routine for the most part. You can use a brush but I’ve tried it and it seems to diminish Cremo’s effectiveness. For me one pass is fine and then a touch up on what I missed or needed extra. I have to say I miss the ‘ceremony of the brush’ but to be honest I never got the ‘glide’ that I do with Cremo. I must admit though there’s something awesome about using shaving soap. Used Creamo today as a slicking agent before using my new Trumper Sandelwood Shave Soap. It works well as a slicking agent from my experience today, but then again, this is my first time with Trumper Shaving Soap. Will try again tomorrow without it using Trumper alone to see if it is the new shave soap giving a great shave or the Creamo as a slicking agent. Will tell. Bought this today and used it as a stand alone wet shave cream using my Merkur Progress with Feather blades. Not the closest shave, I may have used too much because it doesn’t lather. Rinsed well and used my normal shaving soap with a great result! Maybe it still remained and helped my regular “Art of Shaving” stuff? I think I may have to try this with my DOVO straight razor and see how it does this weekend, seems slick enough. I just want a close shave without any nicks. Will post again with straight razor results. Bought yesterday, shaved my head with it this morning with excellent results. 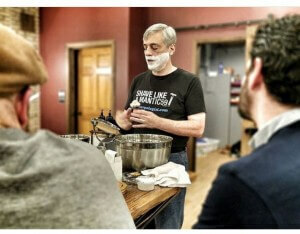 I have a long grey beard but the noggin is shaved smooth as a billiard ball thanks to Cremo! Good stuff! Hah i was gonna comment the same thing and saw your post. its definitely great for my head shave way better than the great result i had gotten from everyman jack shave cream. I will definitely try this on my next face shave. Indeed! I have been usin the CC for about a month. Once you conquer the usage, it works great. I found out less is better, as per the instructions. Bought it with rebate offer. By itself it is more like a shave gel, or other non lathering creams, which I do not like. Added to a soap…or better another cream as a lubricating agent, and it really shines. I forgot after shave balm because it makes such a slick and protective lather with other agents it gave a BBS and left my skin feeling great. Used by itself, it will gum a brush up big time, so beware. If this clogs your razor, you’re using way too much. I saw this product at Walgreen’s (or was it CVS?) yesterday. The company is offering a rebate of 100% of the purchase price. I may have to go back and get some. Yes, I just bought a tube of this tonight at Walgreen’s and found the rebate. You begin the rebate process online, so no need to find a tube with a special rebate form. Just go to cremocompany.com/rebate to start the process; you’ll need to print out a form and send that with your receipt. The rebate offer is good up to $9, and is valid until 1/1/2015. The gotcha is that the rebate specifically EXCLUDES buying it online, so you do have to find and buy it in a retail store. I read this review a while back, after I bought Cremo and found it didn’t play well in my mug by itself. Once my Taylor of Old Bond st. came in, I’d add about a quarter sized daub in the mug, load my brush, and whip my lather that way. Works like a dream. I’ve been using Cremo for several years now. It’s very good on its own, but REALLY shines when used as part of a superlather. I apply a thin layer of Cremo to my wet face using my fingertips, and then apply my favorite soap or cream with a brush. This combines the best features of both into a slick and effective lather. I particularly like using MWF or Tabac with it. On its own, Cremo is a non-lathering product. No matter how much it’s whipped with your favorite brush, it will NOT lather. It is not meant to. In combination with a lathering soap or cream, it’s a joy to use. Cremo has become a staple in the field kits of active military member because it is so simple to apply using only water and fingertips.